This week in Keitai we get tummies rumbling with our guide to cooking a full English breakfast with your smartphone, Winston is the first to use Nokia's Chat service and a pop star tells a story about poo at a phone launch. There are loads of great recipe apps that you can download for your smartphone to give you help and inspiration while in the kitchen – and they can liven up any meal, even breakfast. Apps like Food Network in the Kitchen, Allthecooks and Epicurious can turn your smartphone into an almost limitless cookbook with brilliant recipes from some of the best chefs in the world. The best thing about your smartphone is that it's easy to shop for food and have it delivered straight to your door. Most supermarkets have their own apps that make buying the food you need for a full English breakfast incredibly easy. 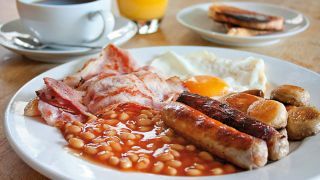 You might have to wait a while to get it delivered, but an increasing number of stores are offering same-day delivery, so if you're smart you can order the ingredients for your breakfast the night before, and have it all ready and waiting for you when you emerge from your bed the next morning. As any breakfast connoisseur will tell you, there's a lot more to the English breakfast than just chucking everything into a pan with a hefty glug of oil. Devices like the Cinder Sensing Cooker gives you precise control over the heat of the grill from your smartphone, allowing you to cook everything to perfection with the help of sensors and guides. Save your bacon by cooking it just right every time by letting your smart cooker know just how crispy you like it – all from an app on your phone. If you don't fancy frying everything, then you can bung some sausages and hash browns in the oven to cook. Smart ovens are becoming increasingly popular, with the LG Smart ThinQ range allowing you to remotely control your cooking from your smartphone. You can even send recipes to the oven to help it cook. Not only can you communicate with your oven from your smartphone, but you can also use LG HomeChat to let it talk to other appliances and interact with smart home devices powered by Nest. That way, your dishwasher can make sure your pots, pans and cutlery are all washed and ready to use when you need them. You can't have a full English breakfast without a cup of tea to wash it down. Devices like the iKettle allow you to boil your kettle using your smartphone from anywhere in your home, or set up a schedule so boiling water is ready and waiting when you wake up. If coffee is more your thing, we won't judge you (too much): the Siemens Connected Coffee Maker can let you brew a cup of java straight from your phone. A million things to say flowed through his mind. 'Hi wot's up'. 'U OK'. 'R U Going to Dans later' seemed to fleetingly fit, but none conveyed what he wanted to say on this iconic handset. Then Winston did something he never thought possible. He opened the 'Chat' function on the Nokia 3310, almost laughing to himself at the thought of it working. 'U There'? He tapped in, before pressing send. He waited. Quietly he put the phone down. What was he doing? It was like trying to browse the real internet or listen to an MP3 on this phone (stupid for two reasons: firstly, it takes ages and was a terrible user experience, and secondly, these features were only enabled on the 3330 variant Nokia put out and everyone knows that). His nerdy internal monologue was shattered at that point by a sound he had never heard, the phone gurgling oddly. He looked down and let out a half neigh, half gasp: the screen read '1 chat received'. Winston paused, before tapping back 'Y did u txt who ru is ths the rason the councl gv me da chrger'. Deep in a Finnish bunker, the last refugees of the Nokia movement jumped up as an alarm went off. The Chat server had finally been used! Bespectacled scientists ripped off sheets of paper everywhere, before sprinting up the stairs and into the old wooden office. What better way is there to celebrate the launch of your new range of smartphones than to hold a swanky party in London and have your pop star special guest regale the crowd about the time she had a poo in a caravan? And now ladies and gentlemen, the BlackBerry 7 smartphone collection. Nothing says 'premium high-end fashion phone' than a fat man in a thin man suit. Sadly the pasty impersonator can't quite fit his excessive gut inside said suit, making for a rather awkward photo shoot with his - we can only assume - equally fat wife who's been squashed into the skin of the girl she hated at school. Thankfully they're both rocking highly fashionable Xelibri phones to draw your attention away from the clearly questionable ethics surrounding their outfit choices. An offshoot Siemens launched in 2003, the premium Xelibri brand lasted no more than a year. Shocker. Pay attention kids, here's a life lesson in basic body language. The suited gentleman in this 1996 Ericsson mobile phone advert, let's call him Frank, thinks he's just got himself a date by merely entering a restaurant and sitting at a table. There's a lady on the table across from him – she looks like a Mallory – and judging by her hand placement she's either on the phone, or has a chronic headache. Either way, the mere fact that Mallory's not even looking at Frank should set alarm bells ringing in his head. Unfortunately for Frank, he has not received this important life lesson and proceeds to embarrass himself by getting mistaken for a waiter. A waiter! You can't get lower than that.